The Goethe University is now accepting applications for Master Scholarship program, funded by the Johanna-Quandt-Foundation Frankfurt. German as well as foreign students are eligible to apply for this scholarship program. The purpose of the scholarship is to foster your academic career, to enable you to become involved in existing research projects and to actively support you during your Master’s degree studies. A Master’s degree is the prerequisite for starting a Ph.D. in one of Goethe University’s seminal research units. The Goethe University is a research-oriented university in the European financial metropolis Frankfurt. As a foundation university, she has a unique degree of independence, urban and cosmopolitan. Course Level: Scholarships are available to pursue MSc and MA courses with a special emphasis on research. Number of Scholarships: 20 scholarships per year will be offered. German students can apply as well as foreign students. All applicants need to have completed at least two-thirds of their Bachelor’s degree (or another equivalent or higher degree) at a university outside of Germany and meet the other conditions mentioned on the website. Goethe University gives preference to candidates who are not enrolled in another German university. Nationality: German, as well as foreign students, are eligible to apply for this scholarship program. 1. Entrance Requirements: To qualify for admission to a Master’s program at Goethe University, you must have already completed a Bachelor’s degree (or another program at an equivalent level) in a relevant field, and have passed the selection process of the respective program. How to Apply: The application has to be submitted via Goethe University’s MasterPortal. Open the application form for the Master program of your choice and you will be guided to the Scholarship application. To identify one of the research units which the Master program of your choice is related to. The respective research unit should match your research interest and be a potential workplace for you in the future (you have to select a single research unit) see: “Master Programmes” or “Research Units” for details on the research units). 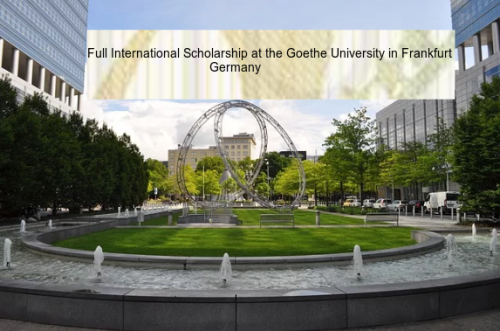 Now that all the information about Full International Master’s Scholarship at Goethe University Frankfurt has been delivered nicely; interested and talented students who are eager to pursue their Free Tuition/Scholarships/Study in Germany can apply now.